Laura Newburgh builds instrumentation to study the cosmology of our Universe. She strives to understand the constituents of our Universe—Dark Matter, Dark Energy, neutrinos, exotic particles—through millimetre-wave measurements of the Cosmic Microwave Background and radio measurements of Large Scale Structure. 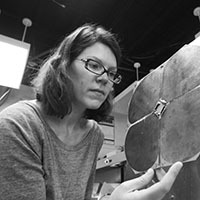 At the Dunlap Institute, Newburgh focused her work on the Canadian Hydrogen Intensity Mapping Experiment (CHIME), a new radio telescope in British Columbia. CHIME will use the 21cm neutral hydrogen line to make measurements of high-redshift structure as a probe of Dark Energy.Newburgh received her PhD from Columbia University. In January 2017, Laura moved to Yale University to become an Assistant Professor in the Physics Department. She will continue her work on CHIME and other experiments, including ACT and the Simons Observatory.